Get ready to experience the journey of adventure, chaos and emotions with Irrfan Khan, Dulquer Salmaan and Mithila Palkar in their upcoming film Karwaan. Malayalam film superstar Dulquer Salmaan will be making his Bollywood debut and the makers have released the new poster of the film. 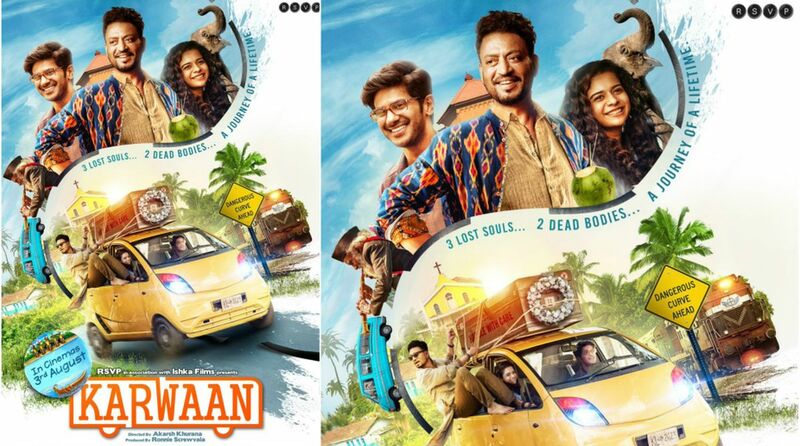 In the poster, Irrfan, Mithila and Dulquer are all in smiles. Written on the poster is 3 Lost Souls, 2 Dead Bodies… A Journey of a Lifetime. Here is the poster, check it out. The film is directed by Akarsh Khurana and produced by Ronnie Screwala. The trailer for Karwaan will be out tomorrow (June 27). Karwaan story revolves around three oddballs from different walks of life, who are thrown together on a somewhat hilarious journey, which will help them find normalcy in their lives. The film has been shot in the beautiful locales of Kerala, which will surely be a visual delight to the viewers. Karwaan is scheduled for release on August 10.